Elizabeth Hermann Smith concentrates her practice in a variety of leveraged finance matters, primarily representing administrative agents, lead arrangers and lenders in syndicated senior secured cash flow transactions, as well as representing mezzanine investors and borrowers in a variety of transactions. Elizabeth is a member of the Restaurant and Franchise Finance team and has experience with franchisor, franchisee and company-owned restaurant and retail lending in both the sponsor and non-sponsor context. In addition to her work with the Restaurant and Franchise Finance team, Elizabeth has experience in a number of other industries, including health care lending. 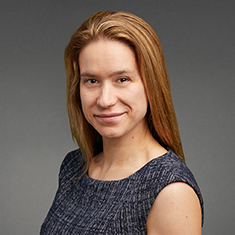 Elizabeth was a 2018 recipient of Katten's Pro Bono Service Award for her involvement in a number of the firm's pro bono efforts including, among others, Katten's Jose de Diego Legal Clinic, the Lawyers in the Classroom program, firm workshops with the EMBARC program, and representation of various non-profits in a number of matters. In addition to firm pro bono, she serves on the Associate Board of One Tail at a Time, a local dog rescue. Elizabeth is a member of the Chicago steering committee of Katten's Women's Leadership Forum. Shown below is a selection of Elizabeth Hermann’s engagements.